Despite soaring gas prices, Kristen Wright took to the road. Wine country was calling and that was a call she couldn't help but answer. Has anyone failed to complain about gas prices yet? As someone who drives a great deal for my various jobs, I have certainly felt the pinch—though sometimes it feels a bit more like a slap—of the ever-rising cost of petroleum. While I like to write about events that take you out of town and into new terrain, I decided instead to write about a local getaway—Lake Erie Wine Country. 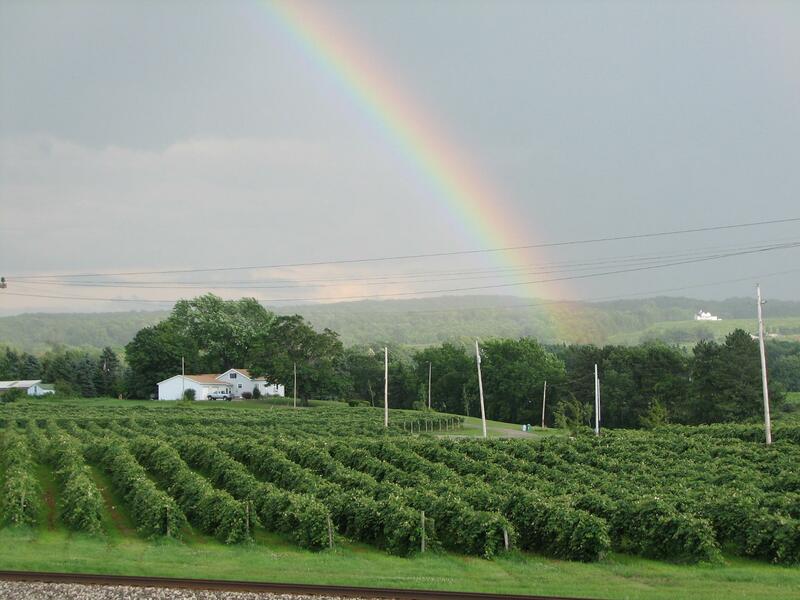 The Lake Erie region of New York and Pennsylvania is the largest grape growing region in the country, outside of California. And though the 2011 Wine Country Harvest Festival is an autumn affair, many local vineyards offer events throughout the year. In fact, you can make plans this weekend to enjoy the Wine and Cheese Weekend. For $35, you can visit all the wineries for Yancey's Farms' cheeses and special fare. Each stop includes a recipe for their selected dish and, of course, tips on the perfect wine pairing. The Pennsylvania side of this region is home to nine wineries. Most are open year-round, though their days and hours vary, particularly during the winter and spring months. I like to begin this journey by traveling east on Route 5 through Harborcreek and into North East. Gently rolling hills covered with grape trellises are backed by the blue waters of Lake Erie. Despite the fact that the vines are not lush and green this time of year, the landscapes still held my gaze with their scenic splendor, a Romantic glimpse of nature so close to home. My first stop is always Penn Shore Vineyards. I have consistently appreciated the musical selections they provide for their visitors, creating an atmosphere of warmth and hospitality. Upon meeting owner Jeff Ore, I quickly realized the pleasing complement of auditory and gustatory is no mistake. Ore is obviously a music lover, and while we chatted next to the upright piano near the many tasters who had gathered, he told me of his upcoming plans to bring live music to the winery. Guitarist Zach Orr, a graduate of the Berklee College of Music, will play during the Wine and Cheese Weekend. You can expect to hear the folk rock sounds of artists like Bob Dylan and Neil Young as you sample the fare and enjoy the variety of wines. In July and August, you can also catch "Music in the Vineyards" at Penn Shore Vineyards. Every Saturday, from 5 to 9 p.m., you can enjoy live music on the back patio with each week featuring a new band. Ore recommends the Noiret, a dry red with hints of black pepper that pairs nicely with a steak. He also suggests you have a cigar on hand for the finishing touch. It was time to ramble on. My next stop was Mazza Vineyards, just a few miles east on East Lake Road. Here you'll need $2 to sample six wines, enough to guide your purchase. Mazza has also acquired South Shore Wine Company, which contains a historic stone wine cellar, the first commercial winery in the county. After Mazza, I take my journey southward, following roads that meander through wine country. I didn't bother to consult a map, nor did I find one necessary. Stopping to take pictures along the way, I felt a sense of peace in the quietness of the country. Satisfying the need to hit the road on a sunny spring day, the wine trail truly stirs the senses and restores the spirit. I found my way to Arrowhead Wine Cellars on Route 20, still in North East. The Mobilia Family's 250-acre farm provides everything they need, making their wines estate grown. Owner Kathy Mobilia gave me a tour of the winery, where we walked between 1,500 gallon-capacity storage tanks towering above us, the sweet smell of the vintner's trade permeating the air. I even peeked inside the lab and looked at their bottling machine, reminded of the process we so often forget when faced with the finished product before us. A great deal of knowledge, creativity, and dedication go into this age-old art. You can find Arrowhead wines all over the country. The fertile ground of their farm provides much more than grapes and the variety of wines they offer attest to the variety of fruits they grow. Mobilia pointed out the cherry trees just beginning to bloom. Their adjoining Farmer's Market will open in early July, where they sell seasonal fruits until November 1. You can also stop by and pick your own. The Mobilias helped their son plant his own vineyard in Delaware last year. As he continues to develop his Fenwick Wine Cellar on the east coast, his parents have created a model for success in Lake Erie Wine Country. The grape did not fall far from the vine. If you are interested in home wine-making, you can buy the necessary juice from Arrowhead Wine Cellars throughout the month of October. Instead of lamenting the end of summer, celebrate the harvest season in Dionysian style. On the last leg of my journey, I like to hit Heritage Wine Cellars. The driveway off Route 20 winds back to a restored 18th century farmhouse. Here you pour your own tasting samples, with over 50 varieties to choose from. Their hospitality won me over the first time I stopped at Heritage on one of my earlier journeys through Erie Wine Country several years ago. As they were preparing to close, they gave me a tour, providing my first glimpse behind the scenes. I have made them my final stop ever since, the perfect way to wrap up a day of exploration and camaraderie. I also enjoy their Delilah Rose, a semi-sweet red. I regret that I could not visit all nine of the wineries, but, then again, the rest remain for another day. If you would like to get tickets for the Wine and Cheese Weekend (May 13-15), or for more information on our local Wine Trail events, check out www.lakeeriewinecountry.org.